other inside space that deserves the best in humidity control. 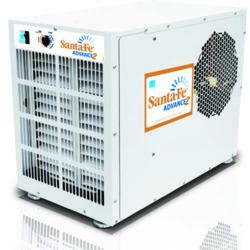 THE SANTA-FE IMPACT IS THE MOST ENERGY EFFICIENT DEHUMIDIFIER ON THE MARKET - EXCEEDING ENERGY STAR STANDARDS BY 50%. THE SANTA-FE IMPACT REMOVES UP TO 105 PINTS OF WATER A DAY WHILE USING AN UNPRECEDENTED 4.9 AMPS (8.8 PINTS PER KILOWATT HOUR) IT EFFECTIVELY DEHUMIDIFIES UP TO 2500 SQ/FT AND IS THE IDEAL FREE STANDING DEHUMIDIFIER FOR MEETING AGGRESSIVE ENERGY USE TARGETS. THE UNIT IS ENGINEERED FOR EXTREME QUIET OPERATION AND IS OPTIMIZED FOR LOW HEAT LOAD. THE HIGH CAPACITY (275CFM) BLOWER ON THE UNIT MOVES AIR IN A WAY THAT NO SMALL CONVENTIONAL UNIT CAN. THE SANTA-FE CLASSIC'S VERTICAL CONFIGURATION AND FLOW-DOWN DESIGN PERFORM EXCEPTIONALLY WELL IN BASEMENTS, AND PROVIDE AS EFFECTIVELY IN BASEMENTS AS THE SANTA-FE CLASSIC.